We're in boot(ie) season and I'm sure many of you have a mix of either traditional leather and/or suede. Traditional leather is a much more durable and less fuss option (in case you didn't know, suede is a form of leather! ), as opposed to suede, which requires a lot more TLC. Genuine suede can be costly, which makes taking good care of them important, if you want to extend the wear and value of your hard earned money, can I get an amen?! I have quite a few suede shoes, both boots and pumps and have learned through past (bad) experiences what to do and not do to ensure they'll last as long as possible and today, I want to share what I do to help maintain the fabric, texture, and vibrancy, which are all pretty simple, but require some additional effort than just putting them on and heading out the door. Rain and suede do not mix well, they can easily ruin the fabric, especially if worn on rainy days repeatedly. After a while, the suede will begin to fade in sections, making them appear spotty and patchy in certain areas, which doesn't blend well, especially with vibrant colors. You may be able to get away with it in the event they do get ruined, if the the boot itself has a more edgier or rustic feel, such as cowboy or biker boots. If you can't avoid wearing your suede boots in the rain, then apply a waterproof protectant spray. It creates a barrier coating, protecting them from the potential water damaged we discussed. I think it's a great idea to spray them every time you wear them, just in case you get caught in the rain unexpectedly, they'll at least be protected. The brand I've been using for a few years, which is very inexpensive and sold at most drugstores is this one by Kiwi. Unlike rain, snow is more compact so it's basically like walking in a puddle, over and over and over. Combined with salted streets, the suede will most likely be completely removed, leaving bald patches behind, which can often appear like black scuff marks and cannot be repaired or enhanced. 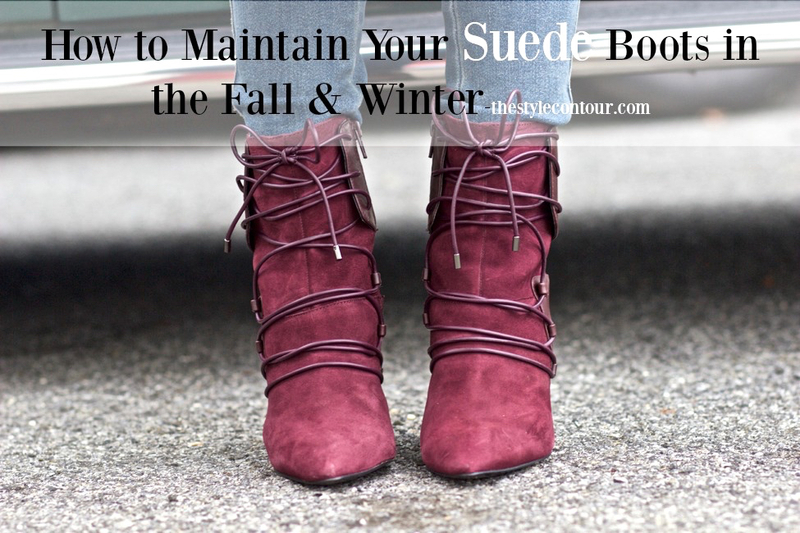 Since suede isn't a smooth texture like traditional leather, if they pick up any dirt or get stained, it can be quite hard to remove; you can't while them away with a damp cloth, like you would with soft leather. This is not to say your boots would be ruined entirely though; if this were to happen, try cleaning them with a bristled brush and suede cleaner to remove the marks. PS: In case you're interested in learning more tips on caring for your boots this fall and winter season, what my YouTube video here. Thanks so much for stopping by, my dear friends, and I hope you have a wonderful day!